Since the discovery that indigenous cultures around the globe used charcoal to improve soil fertility, biochar has received widespread attention for its ability to sequester carbon, improve soil health, and increase crop productivity. Biochar, also known as black or pyrogenic carbon, is generally defined as partially combusted biomass (charcoal) that can be used as a soil amendment for agricultural or environmental remediation (Lehman et al., 2015). Although biochar can be produced from any organic matter, it is often co-produced with bioenergy or heat from low-value agricultural and forestry byproducts, including non-merchantable timber and animal manure. Transforming low-value material into valuable soil amendments could incentivize the removal of invasive tree species, fund fuel reduction treatments in overstocked forests (more on this in an article coming soon), and provide sustainable markets to deal with poultry litter and manure. Despite these co-benefits, a U.S. biochar market is still in its infancy, and few farmers have used biochar in large-scale cropping systems. The disconnect between the development and deployment of biochar-based technologies is in part because we lack agronomic recommendations, and biochar products are not labeled. 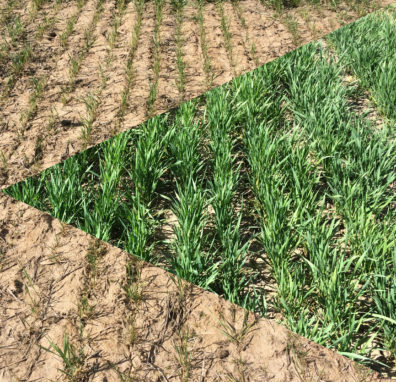 Wheat growing on soil that is amended with biochar (right triangle), overlaid with a photo of wheat growing on non-amended soil. Photo: Kristin Trippe, USDA ARS FSCRU. So how can farmers make effective and cost-effective use of biochar? Biochars can have a tremendous range in chemical and physical properties depending on the feedstock and the method by which the biochar is produced. These properties directly impact how biochar works in the soil. For example, biochars produced at high temperatures tend to have a high ash content, so can be a suitable substitute for agricultural lime (Phillips et al. 2018). Similarly, biochar produced from poultry litter has relatively large amounts of phosphorus, so can be a suitable substitute for fertilizer (Lehmann 2015). 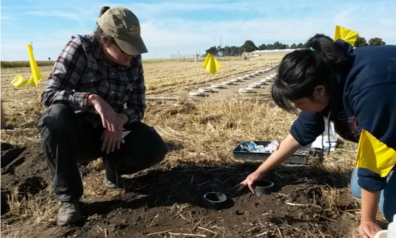 However, because state and federal laws do not mandate that biochars are labeled with physicochemical properties or with feedstock origin, it is difficult to determine how a specific biochar will interact with your soils and crops. The Soil Data Explorer uses an online map to retrieve and explain physical, chemical, moisture and taxonomic data about any soil you choose in the Pacific Northwest. You then receive information about the carbon, fertility, acidity, and moisture properties of your soil, and on whether the properties of that soil are adequate (based on extension recommendations) to grow over 30 common crops grown in the Pacific Northwest or if, and where, there are soil deficiencies. You then select goals for biochar based on those deficiencies. The tool allows you to pick and prioritize three goals for improving soil, such as increasing soil carbon, improving fertility, and increasing water infiltration. Based on your goals, the tool will recommend up to three different biochars for each goal, from among 23 biochars produced from regionally-relevant feedstocks. You can also compare the physical and chemical properties of these biochars head-to-head using the Biochar Properties Explorer. 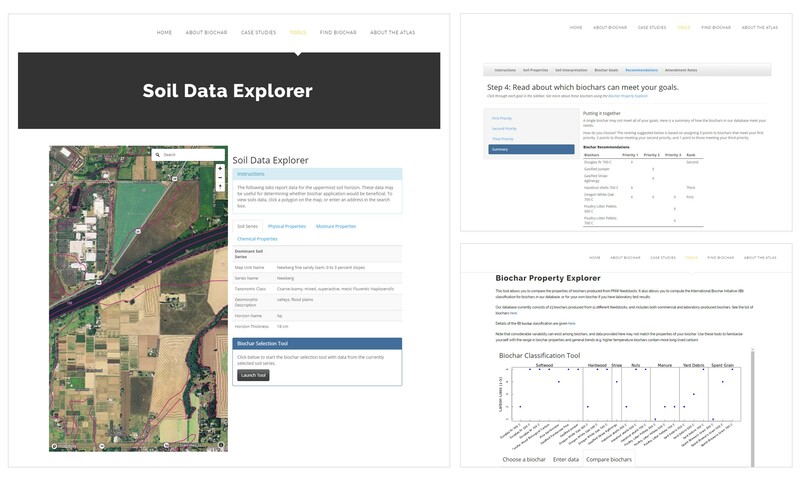 The Soil Property Explorer (left) in the Pacific Northwest Biochar Atlas allows growers to use a map-based function to retrieve information about a specific soil. Information from the Soil Property Explorer is helps growers identify goals and match goals with specific biochars (top right). The Biochar Property Explorer (bottom right) allows users to compare biochar properties. Not sure if biochar is worth trying out on your farm? The PNW Biochar Atlas has a library of case studies with broad and useful examples of how biochar is being deployed in Pacific Northwest soils. From farms to forest, these case studies are short narratives that provide resources for early adopters and demonstrate the broad uses for biochar across the region. The expansion of the biochar market will only happen if biochar can be successfully deployed as a soil amendment. The ability to pair specific biochars with specific soils is critical to this success. The PNW Biochar Atlas provides farmers with easy-to-use tools to accomplish this. We intend to expand the functionalities of the PNW Biochar Atlas by expanding the Soil Data Explorer to cover other regions of the US, gathering more biochars into the Biochar Properties Explorer, and growing the library of case studies. Please contact me with ideas on how we can best help you use these tools. Note: Portions of this post were derived from a pending article in Crops and Soils Magazine. Phillips, C.L., Trippe, K., Reardon, C., Mellbye, B., Griffith, S.M., Banowetz, G.M. and Gady, D., Physical feasibility of biochar production and utilization at a farm-scale: A case-study in non-irrigated seed production. Biomass and Bioenergy, 108, 2018. pp.244-251. Kristin Trippe is a Soil Microbiologist with the USDA Agricultural Research Service in Corvallis, Oregon. Her research program is interested in discovering solution to agricultural challenges using natural products and diverting waste streams. Even though I don’t have a large plot of land, I do use a decent amount of it to grow some food. Now I’ve been having some trouble at getting the seeds to start growing properly. I honestly have not checked the soil and I’m starting to think I should. That and I should see about adding some additives to the soil to help promote plant growth.